RSVP to mkarschnia@plslwd.org or 952-447-9808. 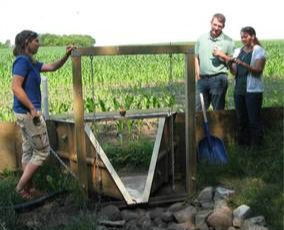 Guest Speaker: Ross Bishop from Cedar Creek Farmers watershed group in Wisconsin will talk about their program. Cover Crop Initiative: Strategically targeting fields for cover crops; discussing best implementation strategies. Lake Friendly-Farm: A locally-based program that publicly recognizes and celebrates farmers in the watershed that are doing their part to keep our lakes healthy. Watershed District’s Upcoming 10-year Plan: Help provide comments and direction on the District’s 2020-2029 Plan, giving feedback on proposed implementation activities. The Farmer-Led Council was very pleased to have Timm Johnson from the Farmer-Led Watershed Committee in Horse Creek Watershed in western Wisconsin present at our last meeting on August 10th. Timm presented information on the Horse Creek Farmer-Led Council which is trying to learn more about their watershed through projects such as on-farm cover crop and test plot projects as a way of finding out where nutrients are coming from & where they’re going. Their goal is to improve the soil health & water retention on their fields while increasing yields and saving money. The Farmer-Led Council was very pleased to have Tim Radatz from Discovery Farms present at our last meeting on April 6th. Tim is a research specialist that has been part of a multi-state, farmer-led research and educational effort to gather water quality information from different types of farming systems. The goal of Discovery Farms is to determine the effectiveness of water and soil conservation practices on working farms to collect practical, credible, information for better farm management. The following is a compilation of workshops, seminars, conferences and other events related to agriculture, the environment and water quality which might be of interest. Note: Any farmers interested in attending an event, conference or workshop which has an a registration fee may be able to be reimbursed by the District. You must own land in the PLSL watershed district boundaries and the event must be related to water quality (or issues that affect water quality, such as soil health). Please contact Maggie (952-447-9808 or mkarschnia@plslwd.org) at the watershed to determine if an event is eligible for reimbursement; events not on this list may still be eligible. This list is merely suggestions, not all events on this list may be eligible. Research-based information to maximize return on nitrogen investments while minimizing environmental risk. The Discovery Farms programs of Wisconsin and Minnesota have launched an online farmer-only discussion forum. The WaterWay Network is a password-protected, online platform exclusively for farmers, crop consultants, and hand-picked experts. It will discuss cover crops, nutrient management, soil health, and water quality. Farmers and crop consultants will provide the applied knowledge and experience, while Discovery Farms and University experts will bring science to the discussion. If you are a farmer or crop consultant, register for an account today and get your questions answered at www.waterwaynetwork.org. There is no fee to participate.